The MPPA established an award and recognition program in 2009, that mirrors the national (PPA) degree program, to recognize photographic excellence and service to the photographic community (and self) through volunteerism and education. It is our hope that these awards will serve to inspire new and current members to become and stay active in the professional community, to continue learning and improving through education and attendance at photographic events, and to recognize those individuals whose photographic excellence and service are exemplary. Awarded for superior photographic competence through photographic competition, advanced education, and service to the profession. Requires 25 points: 13 must be Image Points, remaining 12 from any category. A bar is earned for each additional 25 points. To recognize service, fellowship, and continuing education. Requires 25 points: 5 must be Membership Points, 13 must be Education Points, remaining 7 from any category. A bar is earned for each additional 25 points. This award is reserved for the MPPA to bestow upon a member who has gone above and beyond expectations in their service to association and the photographic profession. The individual may or may not have already received other awards, honors, and degrees. This award is for an individual nominated by the membership or identified by the ARC or Board whom the MPPA feels additional accolades are in order to recognize a member’s continued exceptional service to the MPPA. It is not an award earned by accumulation of points like the other two, but is a special honor that the MPPA may bestow upon a deserving member. To nominate a member that you feel is deserving of this award, please complete the Maine Distinguished Colleague Award Nomination Form. Medallions and bars that are issued as part of this award program are to be worn at all state, regional, and national functions. A certificate suitable for framing will be issued with each award. The Maine Photographic Excellence Award and Maine Fellowship Award are accolades that may take considerable time and effort to achieve. As an added incentive to work hard, be involved, learn a lot, and earn points, we offer the “Lobster Pin incentive”. Those members that accumulate 12 points in a calendar year (regardless of category) will be bestowed the Lobster Pin. You can earn one every year, and it can be worn on your clothing or fastened to your Photographic Excellence or Maine Fellowship ribbons. Your point summary form must be submitted by FEBRUARY 1st each year to be eligible for awards at the MPPA convention the following month. We can not guarantee that any awards or incentive earned will be be presented if forms are submitted after the deadline. 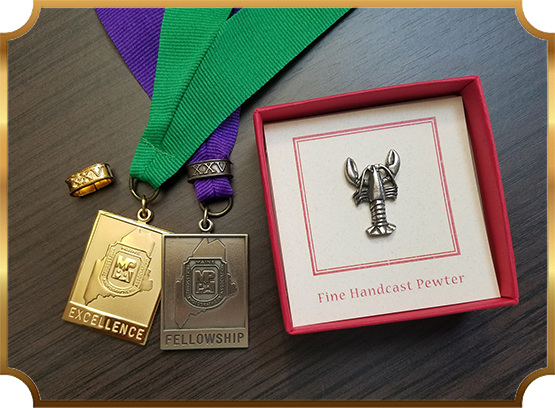 You MAY, however, submit your points at any time during the year and any awards earned will be presented the following year at convention (not to include the lobster pin incentive). Please take a few moments to fill out the form below and we look forward to recognizing YOU at an upcoming awards banquet! You can contact the Award & Recognition Chairperson, Crystal Reynolds, with any questions. If you would like to become involved in the MPPA or the ARC, we would welcome your involvement… and would reward you with some points towards awards, too! You can view a list of last year's events here. Download the complete PROGRAM GUIDELINES & PERSONAL POINT REGISTER to keep track of your points earned throughout the year!